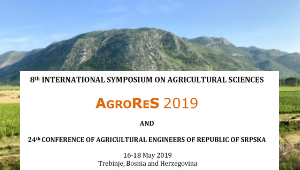 The 8th INTERNATIONAL SYMPOSIUM ON AGRICULTURAL SCIENCES will be held in Trebinje (Bosnia and Herzegovina) from 16 to 18 May 2019. CIHEAM Bari is one of the event co-organizers. Crop Science, Horticulture, Animal Sciences, Agro-economy and Rural Development and Sustainable Management of Natural Resources are some of the main topics that will be covered.